Before I begin this article, I want to thank those of you that have called, emailed or stopped by the house to see if I was OK. I realize I have not written for awhile, and I am thrilled to think that some of you missed my writing enough to take the time to make inquiries about my health. A brief explanation: I started writing my third cookbook almost two years ago. For some reason I ran out of interest and put it on the back burner. However, September 21 was the fifth anniversary of my husband’s — Bob — death and I decided to complete the book and dedicate it to him. That meant instead of procrastinating I needed to get busy and write. And I did. The book is now complete and in the hands of my publisher. A great deal of my time was spent writing the 197 recipes that this book will contain, which will be ready for sale the beginning of November, just in time for the holidays! Additionally, I have become fascinated with the lifestyle of my friend Cowboy in North Dakota. I find that I am flying there once a month for a few days at a time to do things like go to horse, goat and pony auctions. Just recently we went to the Building Steam Western Minnesota Steam Thresher’s Reunion (WMSTR) in the town of Rollag. Cowboy had never been to this exhibit and since he has so many of the machines on his farm he thought it would be fun to go. We drove the 110 miles to attend one day of the two and a half day show. I keep taking notes of these activities, with the thought of writing articles about life in the Midwest, but for some reason have never put pen to paper — or fingers to keyboard as the case may be. At the risk of being too verbose – I want to say a few words about the Steam Thresher’s Reunion, but in order to make my point I need to explain a few things about it. The reunion first began in 1940 when a Garr-Scott engine was fired up to thresh grain with steam again for the sake of reminiscing. It has continued to this day. The WMSTR is a volunteer-run and non-profit organization. It is also not your typical museum, because visitors are able to interact with the past and experience what life was like hundreds of years ago. There were steam shovels on display, and we could have taken a ride on a steam powered train. Numerous houses and buildings ranging from an early log cabin to a large farm house are also on display. A steam powered merry-go-round was available for rides. 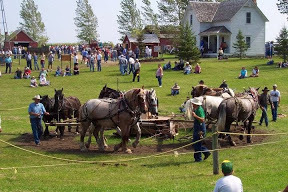 In addition to all of the steam implements, there were gas tractors; sawmills and horsepower farmsteads all available for viewing and operating. their toes and dancing in the aisles with the songs they sang. There were large groups, small groups, gospel singers, etc., and the entertainment went on for hours in many different locations. But here is the reason I am even sharing this. I would guess there were probably more than 1,000 men in attendance, and maybe half as many women. The place was packed, and there was all sorts of food available — from hot dogs to ice cream to fry bread and fruit stands. But there was no hard liquor and no beer! Can you imagine a function like that here in San Diego with all those hard-working men, geared up in flannel shirts, boots and cowboy hats and not one drop of alcohol? It absolutely would not happen here, short of being some kind of Alcoholics Anonymous function. And everyone, from the men to the women to the children seemed to have a great time! It truly embodied the family-friendly function it set out to be. There were no drunken cowboys, no fights — just good, fun and entertainment. I have always heard that life was different and slower in the Midwest than on the West Coast. If this is an example, it was a fun experience and one I look forward to having again. Well, giddyup woman! A fun story to read, reflecting the fun you had. Never any pictures of Cowboy? Better not tell ’em you’re a Cali girl, they just might make you sing the Beach Boys! I don’t know Z. I wear cowboy boots and a cowboy hat when there. Try not to sing although happiness makes one do funny things! Interesting info not provided in article. 1. Event held every Labor Day weekend. kind and said to have helped, dig the Panama Canal. way they used to, and spinning yarn, sewing and making things the way that was done back then. 5. After dark, the fireworks display from the steam powered tractor, which had thousands of visitors watching from up close to those sitting in or on top of cars and trucks. 6. A large camping area for those who came to enjoy the whole weekend of festivities. 7. As their flyers say, you can’t see everything in just one day. That is so true. http://WWW.Rollag.com for more complete information. An opportunity to see, experience what our fathers, grandfathers and/or ancestors lived back then. Thank you for your kind words, Judi. Rollag is the highlight of our year! We enjoy singing our country love songs at the Nelson building and gospel songs at the Downer Church each day. There are approximately 3,000 volunteers to run the 4 day show. They pay the entry fee as well as as all others. Don’t forget the thresher men’s breakfast they serve….pancakes, hash browns, sausage, scrambled eggs, coffee and juice!